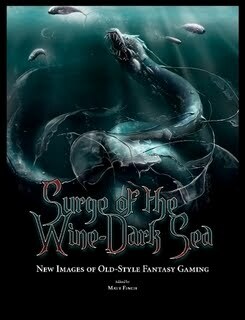 Matt Finch, mad genius behind Mythmere Games, emailed me this morning to let me know that ‘Surge of the Wine-Dark Sea’ is now available from Lulu — in either softcover or hardcover editions (or PDF). This full color book is filled fantasy and swords & sorcery illustrations by artists of the D&D “Old School Renaissance.” These artists have created the visual imagery of recent publications focusing on playing D&D by its early rules, including works by publishers Pacesetter Games, Mythmere Games, the First Edition Society, Frog God Games, Usherwood Adventures, and many others! Stefan, I have been looking through my artist pdf copy and it rocks. I'll for sure be buying a print copy. Love your work in it. Oh yeah, congrats on your deal with James Raggi and Exquisite Corpse. That is one of my favorite monster books for sure! I explained to both of them how it was simply cool and my wife made me order a hard cover. I'm glad I did (there's a coupon out there that pretty much makes the shipping free or wicked cheap), the pdf looks pretty good.